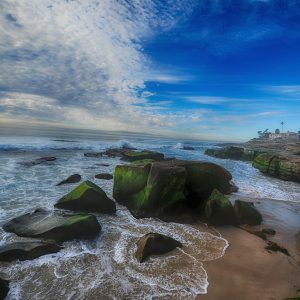 My name is Frank McKenna, a La Jolla Photographer. I love San Diego because we have some of the best sunsets in the world. With an average of 266 sunny days a year, San Diego more often than not will not disappoint visitors looking to get that perfect sunset shot. Keep in mind however that the best sunset shots are usually not days of pure sunshine but days when there are clouds in the sky. 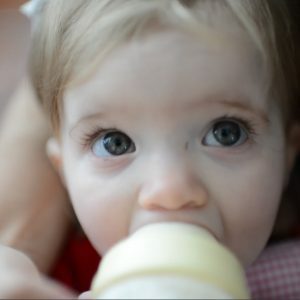 I take sunset shots in San Diego often and have found what I believe are the best places in San Diego to get that perfect sunset shot. I also included some tips on how to get better ocean sunset shots. 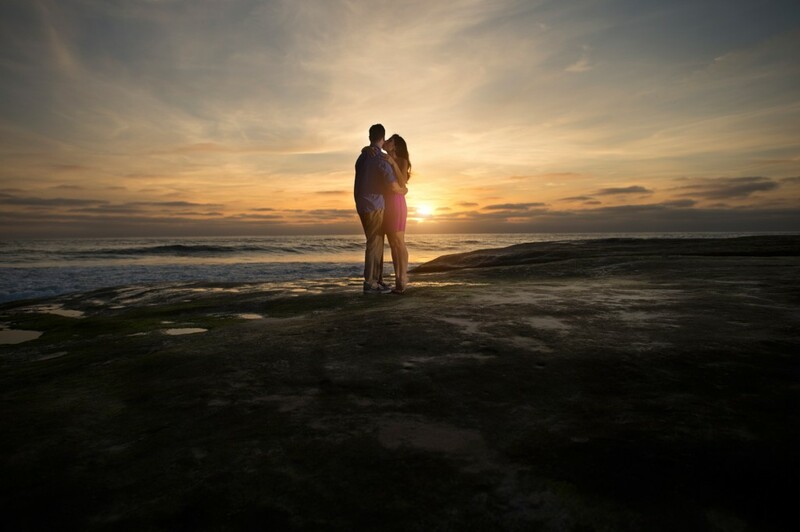 This is the #1 location in San Diego to capture the most beautiful sunset shots. There are many reasons why professional photographers choose this location for their photo shoots. 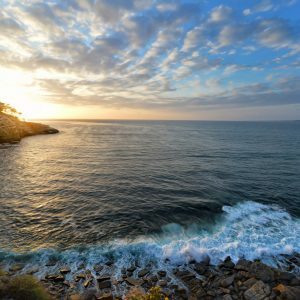 First the coastline is rugged and rocky and so there are lots of places for you to take a variety of different sunset ocean shots. Secondly, there is a very cool surf shack that provides a perfect element to incorporate into your shot and finally you have unobstructed views of the Pacific all the way to Hawaii if you could see that far. 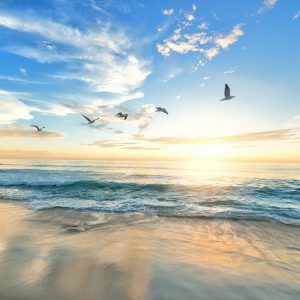 Make sure you get to Windansea about 1 hour before sunset to give yourself plenty of opportunity to find the perfect spot to take your photo. This place is also in La Jolla. It’s not secret that if you want to take the best sunset ocean shots of your life that you have to take the trip out to La Jolla and that is why this places makes the second top spot in my top 5 places for sunset shots. 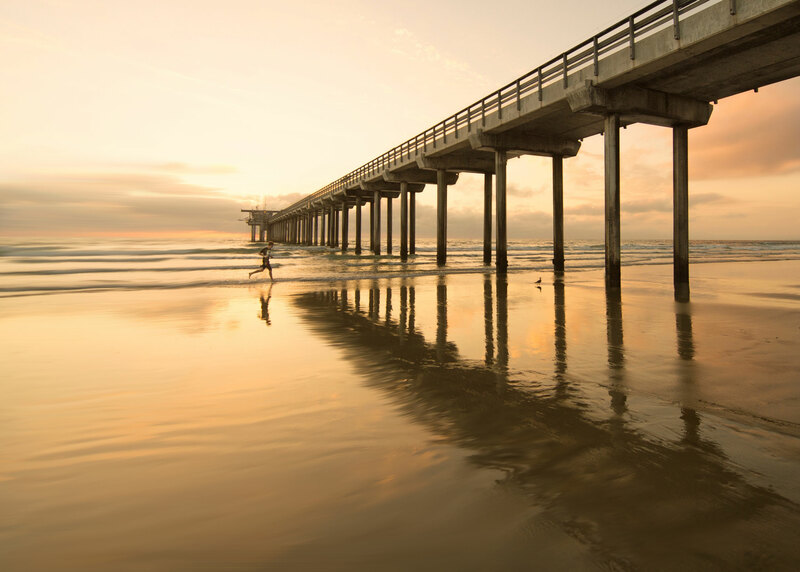 To get to Scripps Pier you will need to park your car at La Jolla shores and take a short but beautiful walk along the beach until you get to the pier. The reason this is a top spot for sunset shots is because the variety of photos that you can take from this location. You can capture sunset with the pier in the foreground or if you might even be able to capture the sun setting between the pillars of the pier if you are lucky. What makes this location so extraordinary is the way that the water will glow on the sand as the sun begins to set. Since the beach is long and shallow, the water stays on the surface of the sand for along while allowing you to capture reflections of the pier in the water itself. It is simply amazing the shots that you can get at this location on a good day. Mission Beach is amazing for sunsets. Mission Beach is on located on one of the skinniest stretches of land in the US. The tiny strip of land is as populated as Hong Kong but boast the freshest air in the country thanks to the fact that the ocean air and bay air collide making this place air pollution free. Come to Mission Beach to people watch and watch or photograph the sunset with thousands of other people. You will notice that everyone here is looking for the “green flash” which is the phenomenon when a bright green flash occurs immediately after the sun sets. I like to head a little south down to the Jetty to capture the sun piercing through the eye of needle at this location. 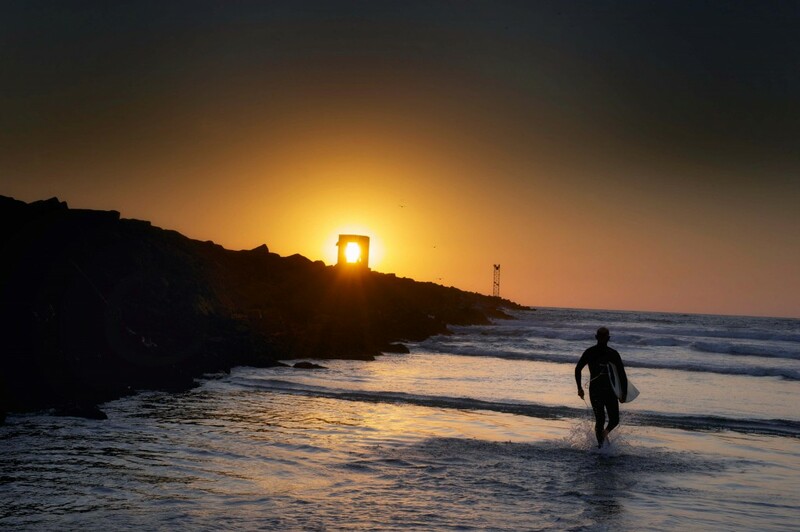 Sunset Cliffs is located in Ocean Beach which is just on the other side of the Mission Beach Jetty. This place is out of this world during sunset. 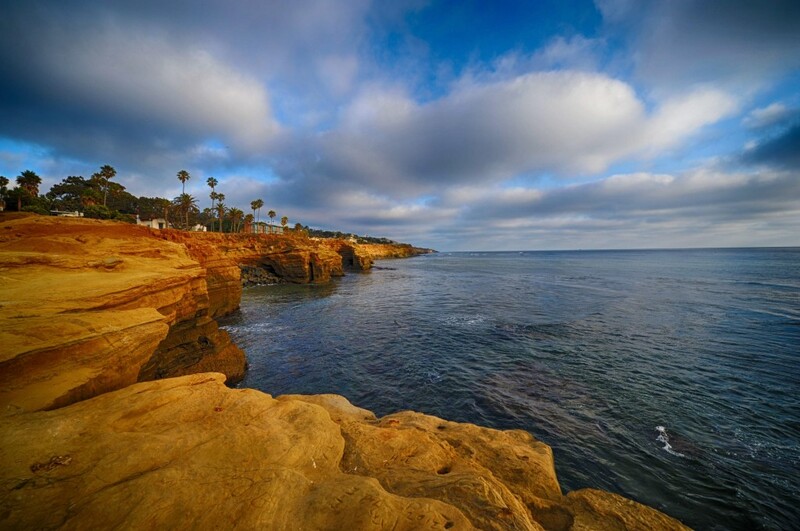 This place was called Sunset Cliffs because everyone wants to come to this place to watch the sun set. What makes it unique is that the sandstone cliffs are rugged, jagged and turn gold as the setting sun hits them just before the sun is completely set. The color at this place is just amazing for photography. If you are going to take pictures here, arrive about 2 hours before sunset to give yourself a chance to walk along the ocean front path to see all of the cliffs. There are spots where you can go down steep paths but down to secluded beaches. If you are a bit more adventurous, you can try that but it wet weather it gets too slippery and can be dangerous. If you want to take some scenic sunset pictures in a place where only the locals know about head North on the 5 freeway, get off on Del Mar Heights Road and head straight down to 4th Ave and park your car. 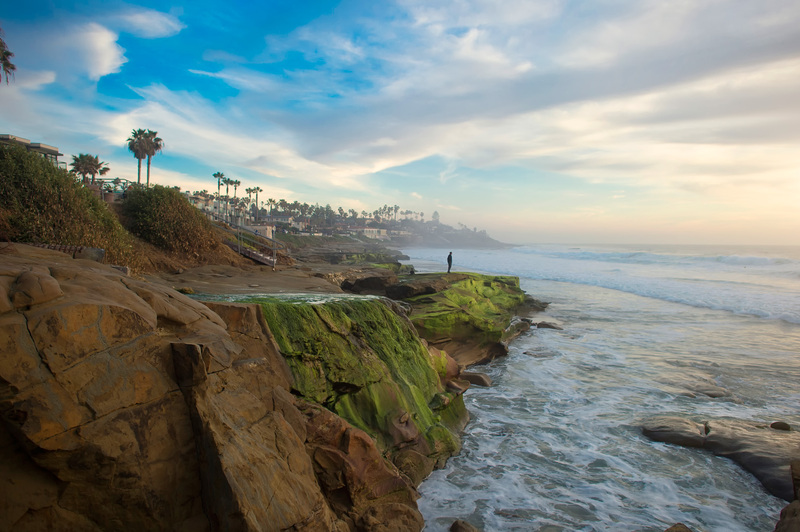 Make your way down to paths which wind along the Del Mar Beach cliffs. There is about 1 mile of paths which wind north along the coast until you hit central Del Mar which is a great village to go and have a nice dinner and walk after your photo session. What I love about this area is the Amtrak coaster trains which cross the tracks in front of the beach every half hour or so. I haven’t been able to capture sunset shots with the train in the shot yet but I have seen them by other photographers and they are amazing. 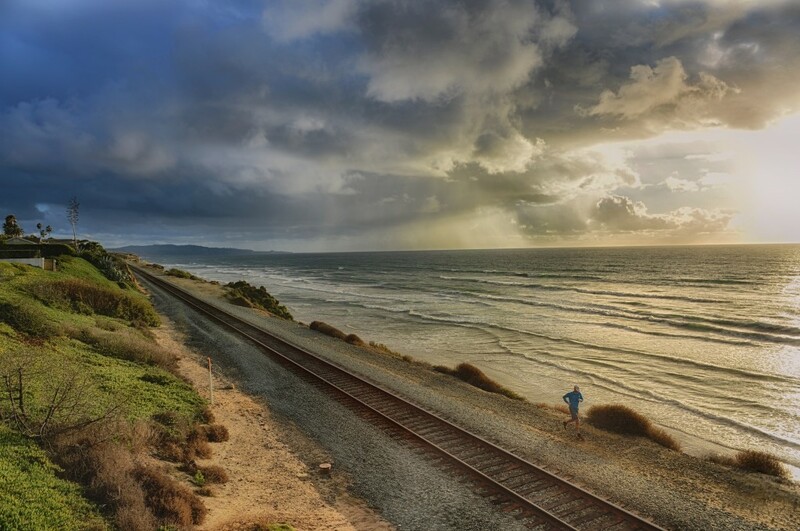 Even if you just want to walk these paths at sunset or even have a sunset jog, South Del Mar is an amazing place to go. 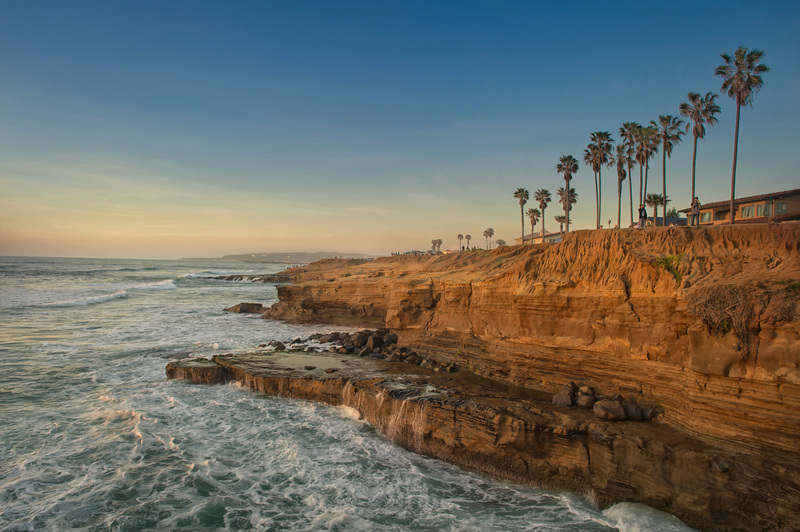 Now these are not the only places in San Diego to take awesome shots of the sunset, you can also head over to any of these other places to capture some pretty tremendous photos of the sun setting. 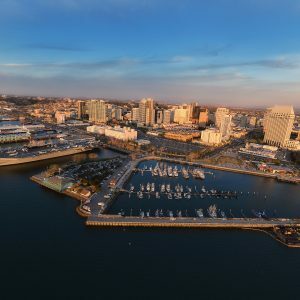 #6 – Coronado Ferry Landing – http://goo.gl/maps/jcxQK – This is the place to get awesome cityscape photos of the sun setting directly against the San Diego Downtown skyline. 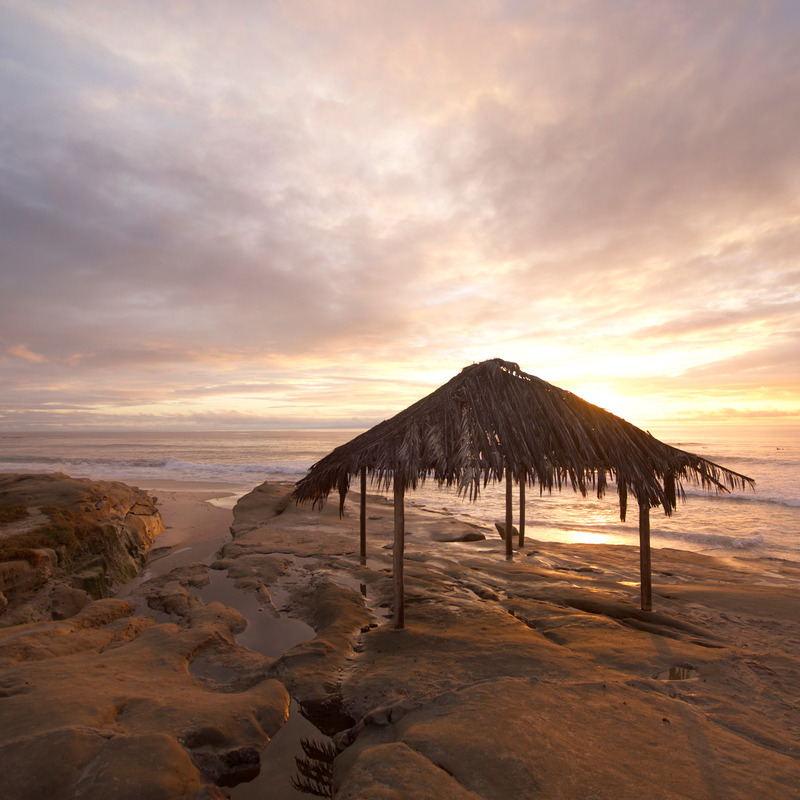 #7 – Oceanside State Beach – http://goo.gl/maps/3ujjr – This is the most northerly beach in San Diego County. The beach is very flat and there is a pier there. I get great shots there all the time. 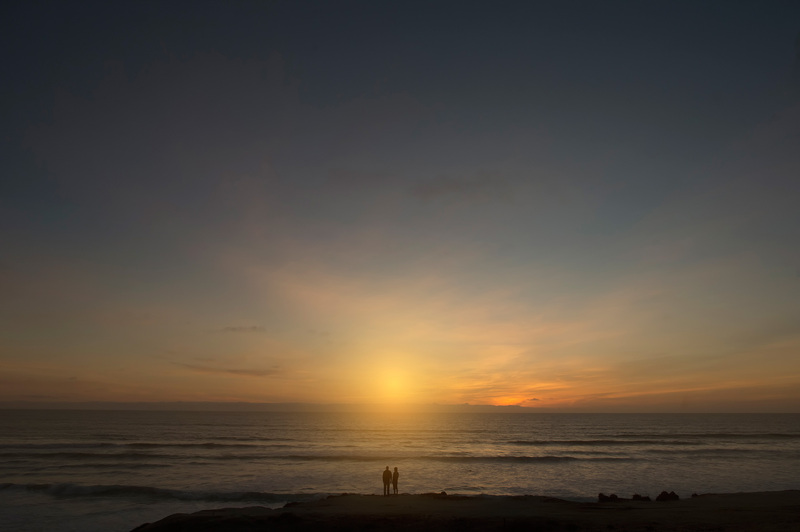 #8 – Soledad Cross – http://goo.gl/maps/MWxs2 – If you want to get a birds eye view of the sun setting over the La Jolla Coast as well as sweeping views of San Diego. 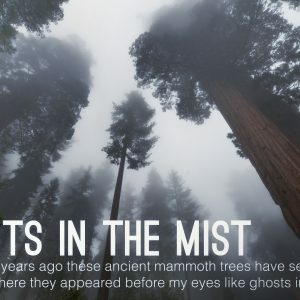 Head here – it is beautiful. Tip #1 – Get to the location early. In San Diego at sunset there always tends to be a layer of clouds just on the very edge of the horizon. These clouds can be dark at times so the actual time when the sun sets can be 10-15 minutes before the official time you read about. If the clouds are particularly thick you will not be able to catch the light or the sun itself whole it dips off the horizon. That is why I always tell people to get to the location early. If that happens at least you can catch shots while it is still higher in the horizon. 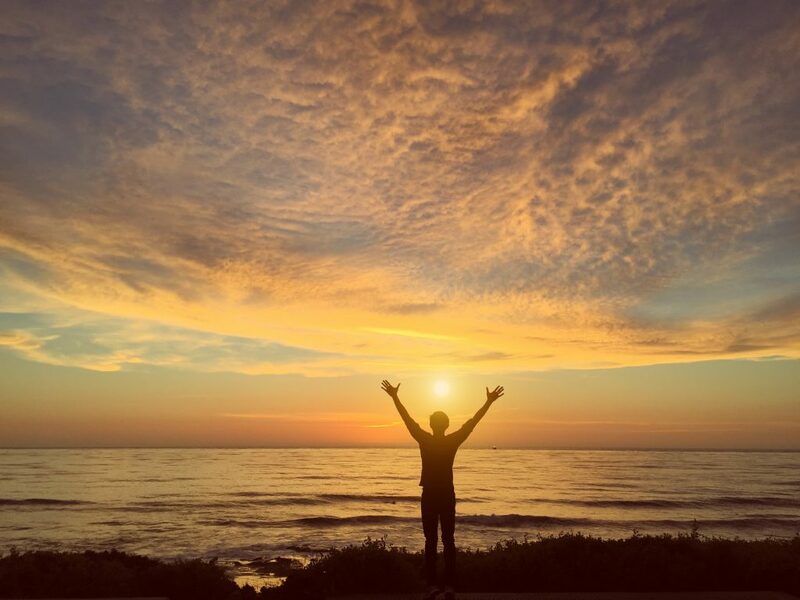 Tip 2 – The best sunsets in San Diego are in October or when there are Santa Ana conditions. Sunsets in San Diego get very beautiful in Autumn. The best sunsets with red skies seem to happen when there is an Indian summer or when there are Santa Ana conditions when the wind sweeps off the desert and blows hot air offshore. I am not sure why. If your planning your trip to San Diego in October you might see some amazing sunsets. 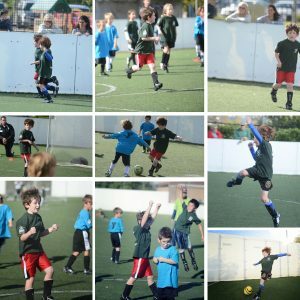 Tip 3 – Under-expose your shots. Turn your camera off the fully automated setting and use the P setting or the A setting for Aperture priority mode. If you are using the Aperture priority mode make sure to set the aperture to 5.6 or greater. Set your exposure compensation down by 1 or 2 notches so that you don’t over-expose the photo. For sunset photos it is better to underexpose them so that you can capture all of the colors. What tends to happen is the bright sun setting tends to trick your camera into thinking the whole scene is bright so it will wash everything out. That is why you need to under-expose the shots. 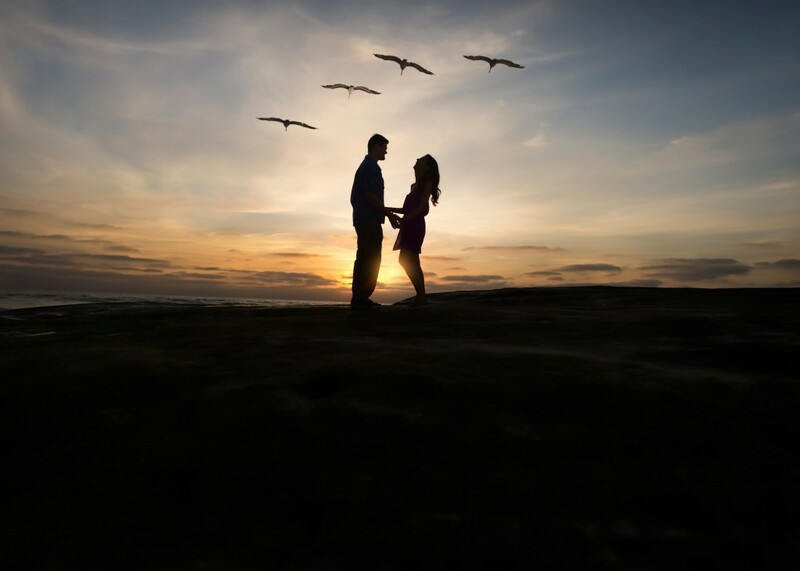 Tip 4 – Use a flash if you are trying to take a picture of someone in front of the sunset. Position your subject so they block out the direct sun in front of you and put your flash on so that you light up there face while still being able to see the background. Tip 5 – Position the sun to the very edge of the photo so you capture the light but not the direct sun. Put the sun outside of the frame so that it doesn’t blow out the shot. In most cases if you are taking a picture of someone in the sunset you always want to position the direct sun so that it doesn’t blow out the rest of your picture. It’s also always important to use a flash.